I checked Amtraks schedule, it due to arrive in Chicago around 8:40am wednesday. According to RideonRulz sighting yesterday in MD, the exVRE bilevel cars should have returned home this morning at Chicago Union Station. No sightings, but one would expect that they would have been delivered to the yards west of Western on the UPW/MD lines. Well, I saw them being pulled on the UPW tracks (with UP locomotives) this morning, 8:45am, in VRE signage. 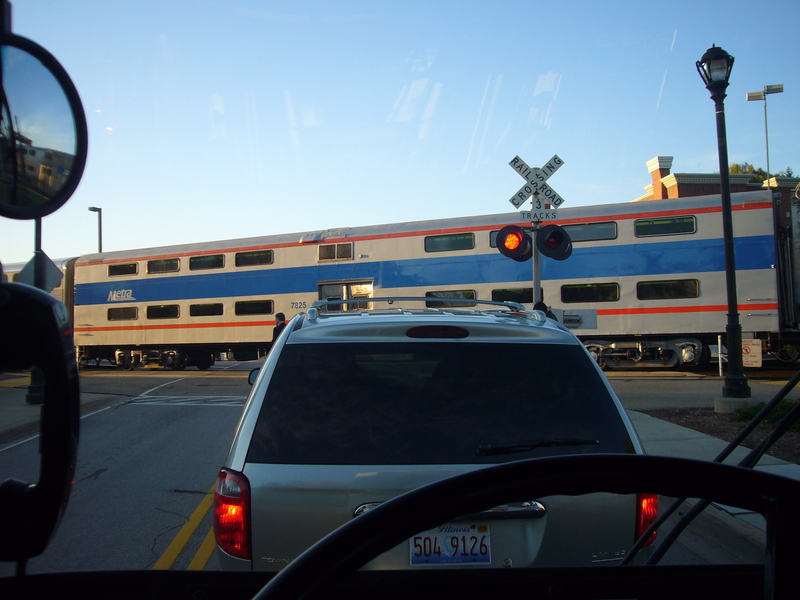 Today I drove past the Metra shops on Grand ave. and sitting there was Pullman bilevel coach #7836. It was in the red/blue Metra scheme. And there are also some F40Cs there too. Are they using these locos at all? The F40C's are pretty much retired. They were going to use them for work trains, but I don't know if that will still be the case or not. They did pull them out of moth balls last winter when the MP36's did their usual crapout. 7840 was in a consist on the Rock Island yesterday. So it appears that they might be fanning out the re-rehabbed cars and shifting equipment around to make up an extra string for the UP, instead of just taking the 5 cars and doing it that way. Must have got their direction from CTA...you know make 10 moves to get it done instead of 2. (Then they cry they don't have money to hire help). According to the current issue of On The Bi-Level that found its way onto trains today, in response to a question regarding taking bathrooms out (page two, the Sounding Board), it is noted that Metra actually has purchased 14 of the older, previously sold coaches. So somewhere out there, there is another 9 on the way, or in hiding. With Daley raising parking taxes, maybe more will ride. With Edens Expressway construction ending, maybe fewer will. With gas prices going down...or maybe back up. Or maybe this is like the no seat bus, but in this case, a few more seats, then start packing the standing room again. As Archie Bunker would say, you can't put standees in the terlet. Or maybe there will be fewer jobs downtown. Or maybe those on LaSalle Street won't have the money to drive or take the cab (like a certain person from Lehman Brothers). Hence, one can't predict economic trends. After all, fares went up Feb. 1 and ridership is way up (at least on the northern routes). Another thought...maybe the increased income is because Metra can't effectively maintain ticket control with regard to standees, i.e. no clip to insert the ticket, harder for the conductor to navigate the aisle. However, trainman can better speak to that. If a conductor can get through the aisle, just as easy to get a ticket from someone standing as it is from someone sitting. Heck, nobody keeps their tickets out anymore anyway. But....if it is so packed you can't get in, one may just say the heck with it. Usually depends on the attitude of the said collector. Well here are a couple of pics I shot this morning of one of the five bilevel cars from VRE, while waiting at the Palatine Metra station. Pullman bilevel car #7825 was on a 7:50am inbound train. It was great to see the old cars again. I was glad to have had my camera ready. Btw, Im behind the wheel of Pace Nabi bus #6646 on Route #699 SB. ...unless they bought more cars than the 5. I am surprised these are the coaches Metra has decicded to repurchase. I thought they would have been the older ones that were on the BNSF. I was driving toward Ottawa on Route 71 and saw two of these older cars on a siding. They were clearly old Metra cars. The Metra logo and numbers were painted over, but they had this paint scheme. Possibly those that had been rehabbed for VRE and other service are more usable than those "sitting on a siding." Obviously, though, the stainless steel shells on the Budds would not have rusted. Maybe Federated Railways (owner of the ex-BNSF cars) wanted substantially more for each car than VRE did. Also, I understand Metra has contemplated buying the ex-C&NW cars they sold to UTA in addition to the VRE cars. 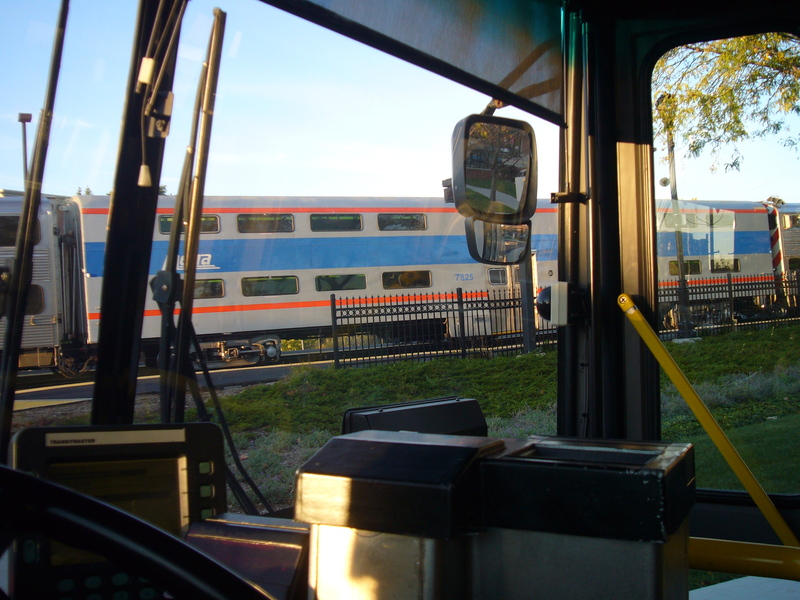 Some of the cars sold to UTA were unrehabbed ones. How many ex-BNSF cars did Metra retire? The UTA has stocked piled a lot of equipment. Not only do they have former Metra equipment, but they also purchased some Comet New Jersey Transit coaches. They must have over 15 pieces of equipment. Why am I getting only Alfred E. Newman when clicking on the links? IIRC, the Federated site mentions them having around 45 cars (all ex-BNSF). Yes, some of the cars sold to UTA were in pretty rough shape. Metra 7793-7796 and 8745 were among the cars that were shipped west circa June 2004. I think the original concept at UTA was to have these cars operating in the same consist as the new Bombardier-built double-deckers. However, at some point the ex-NJT "Comet" cars became available, which appears to have superseded any plans to rehab or use the ex-Metra cars. Exactly. I thought Metra said they wanted to get rid of all the metal coaches (like the ones they have repurchased) since those required more work to maintain and paint. The old BNSF coaches were all stainless. I believe Metra has rehabbed all the BNSF coaches in the 700-800 series with the exception of a few 800 series former cab cars.